It was not so long ago when Rike needed a lengthy introduction. Not any more. This brand is growing strong and continues to make inroads to the coveted US knife market with exciting new offerings. Today we’re focused on the Rike 1504B. The Rike 1504 model line has two primary variations – A (sheepsfoot blade design) and B (spear point design with a milled fuller that runs a good portion of the blade). 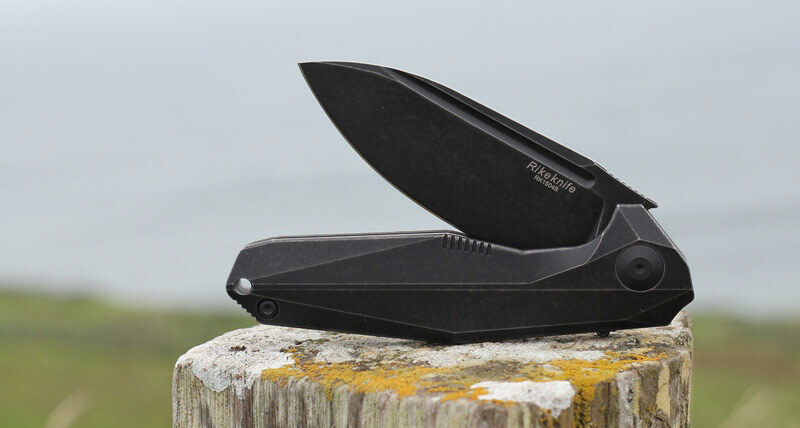 Our 1504B is a mid-sized folder that plays rather big in the hand, with its large sweeping blade design that maximizes the 3.75 inch blade usage, and allows for a multi-purpose application of usage. Oh, and I hope you like blackwash, because the 1504B is covered in it. If not, don’t fret because Rike has dished up a variety of colors in the 1504 line to suite your tastes. Rike knives are no stranger to us. At this point, we have reviewed several of them in the past, all with extremely positive results. Still, we take nothing for granted so approached this review like any other. That said, a sneaky part of me suspected we might be in for a treat with the 1504B. I was right.